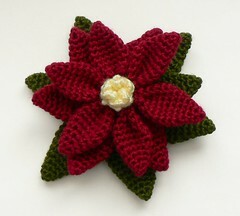 Thank you for this pattern .Ireally like your Poinsettia . Awesome thanks for adding it… I’m thinking these would make lovely hair clips if they’re not too huge, otherwise I can see putting them on clips that could be… well… *clipped* to tree branches. Nice!